(NaturalNews) President Obama's second term thus far has been consumed in scandal, including new revelations that the Internal Revenue Service (IRS) has, for years, targeted key conservative constituencies including Tea Party-related organizations for political considerations. 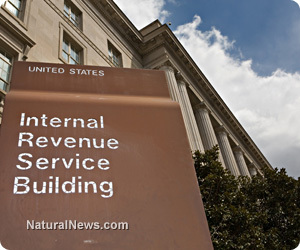 But in addition to conservative and Constitution-centric organizations, IRS officials have also targeted key Jewish groups, also for the same reason, National Review magazine and other media outlets have reported. On Friday, May 10, Lois Lerner, the IRS official in charge of the division that handles non-profit groups, admitted that her agency was indeed targeting conservative groups and apologized. "That was absolutely incorrect, it was insensitive and it was inappropriate. That's not how we go about selecting cases for further review," she said at a conference sponsored by the American Bar Association. "The IRS would like to apologize for that." Apparently, according to reports, IRS officials within the non-profit division were singling out entities that used the terms "tea party" or "patriot" within their organizational name on their tax-exempt forms. Jewish groups also being targeted? While they are at it, the committee might want to ask the IRS whether their list of targets extended beyond political party discrimination. There is evidence the IRS also targeted pro-Israel groups whose positions were potentially inconsistent with the administration's. For example, in 2010, the passionately pro-Israel organization Z STREET filed a lawsuit against the IRS, claiming it had been told by an IRS agent that because the organization was "connected to Israel," its application for tax-exempt status would receive additional scrutiny. This admission was made in response to a query about the lengthy review of Z STREET's tax exempt status application. In addition, the IRS agent told a Z STREET representative that the applications of some of those Israel-related organizations have been assigned to "a special unit in the D.C. office to determine whether the organization's activities contradict the Administration's public policies." And at least one purely religious Jewish organization, one not focused on Israel, was the recipient of bizarre and highly inappropriate questions about Israel. Those questions also came from the same non-profit division of the IRS at issue for inappropriately targeting politically conservative groups. The IRS required that Jewish organization to state "whether [it] supports the existence of the land of Israel," and also demanded the organization "[d]escribe [its] religious belief system toward the land of Israel." The pro-Israel lobbying organization, in its suit, claimed the IRS activity amounts to viewpoint discrimination - a constitutional violation of free speech provisions contained within the First Amendment. Among other things, Z STREET is seeking complete public disclosure of the origin, development, approval, substance and application of the IRS policy stating pro-Israel organizations must be treated differently than other groups. For years the nation's tax agency has not only denied it targeted Z STREET for inappropriate scrutiny but has also prevented the lobbying group from pursuing claims of discrimination, Jewish Press reported. Z STREET additionally claims that the IRS took the actions it did because Israel is a country "where terrorism happens," and because of that the agency was justified in taking more time to see if the organization was ever involved with terrorist funding. "Z STREET is a purely educational organization and has never funded anything, either in Israel or anywhere else," the Jewish Press said. The same branch of the IRS, dealing with such applications, also came under criticism last year when confidential tax documents filed by American Crossroads, the nonprofit organization associated with Karl Rove, were illegally leaked to the media and published by ProPublica, the nonprofit project funded in part by George Soros's Open Society Foundations. No one has been charged in that crime. Sounds like President Obama's IRS doesn't much care for his political opponents.